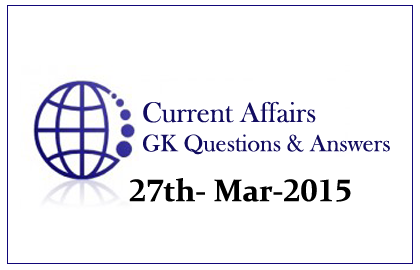 1).Who is the Director General of International Atomic Energy Agency? 2).Name the Institute which has been selected for the Gandhi Peace Prize for the year 2014? 3).What is the subject of the NITI Aayog’s first meeting? 4).Where was the Urja Sangam 2015 was held? 5).Recently, NASA’s Curiosity rover has discovered the availability of _____ on MARS. 6).India has signed six pacts including agreements and Memorandum of Understanding with____ to increase the commercial and economic exchanges between both the nations. 7).Name the state which has launched India’s first E-Ration Card Service? 8).First goods train from Assam was launched between ______ and ______. 9).AFC stands for- Asset Finance ________. 10).Recently, Ruth Porat has appointed as the Chief Financial Officer of_______.